hmm... i've had raw durian and durian in a pastry. in all three of the times that i've had it, it tasted like green onions. the smell doesn't bother me really, my brain turns off the smell sensors for a bit. but man, the green onion taste in something that's supposed to be sweet. it gets to me every time! Danny - Danny, you're a braver man than I. I can't really help but dislike the smell, even if I consciously make an effort to tell myself it should taste more like a vegetable than a fruit. 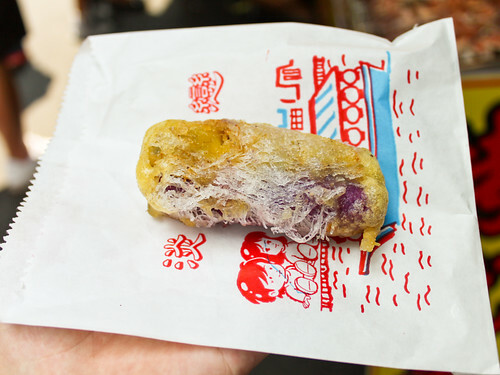 I think you'd love fried durian though, for sure. Have you had it before? That LOOKS pretty good, but I have horrible memories of durian from my younger years. I remember my parents offering me a piece. Trying to impress them I gobbled it down, but started to gag. Haven't tried it since... should I give it another chance? Lamchop - nope, I did the same. Except my grandmother told me it was ice cream. Liar. It's not really good for me normally, but I do like it fried and, ironically, in ice cream form. I love Durian, after my mum told me it was cheese ^^"